Well over at 'Less is More' this week you have to make a card 'In The Frame'. I have had these magnetic stamps for ages and never used dthem so decided to give it a try. There is 2 frames and 10 different inserts. I have inked the frame using a little 'pen' type ink pad with yellow and green and then inked the insert with a brown one. I think it looks a bit squint but this was my first attempt so please forgive me. The sentiment is a rubber stamp I have had for a while as well so inked it up with the same brown ink pen as the centre image. I feel the card looks a bit bare!! What do you think? 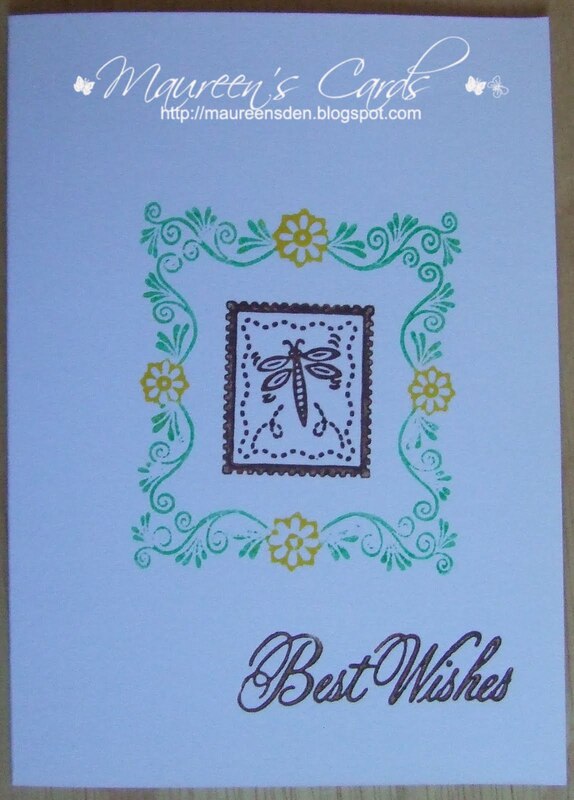 The card is not too bare at all Maureen, but if you want to ensure that your stamping is absolutely straight, you can use some form of stamp positioner. I use Lego blocks and sheets of acetate, but Stampin' Up do a gizmo called a Stampamajig, which does the job brilliantly. You could order one through Mandi! I can really recommend that you try it! You card is fab by the way! It is a little squint Maureen, but for a first attempt its super! It's a lovely card-I really like that frame. Definitely a LIM card...not to bare at all. And...very pretty!